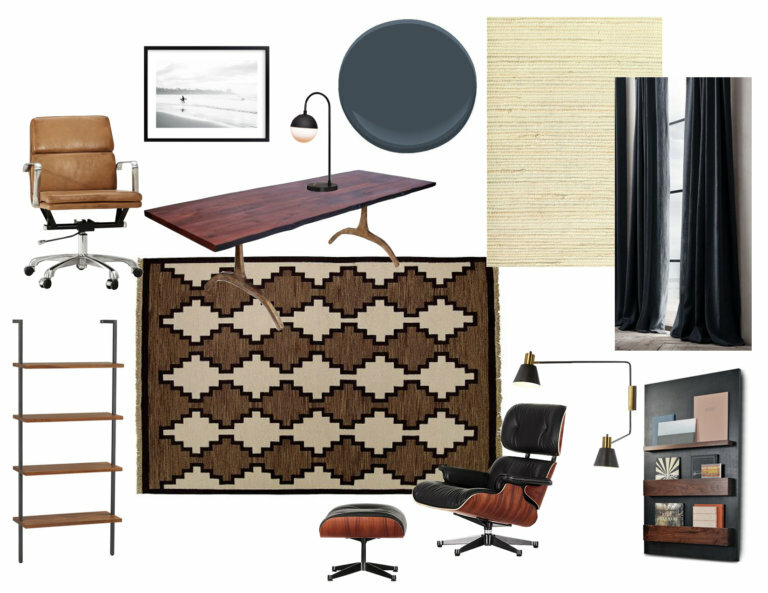 Hey there I’m hitting you up with part two of our office project reveal for our Mulholland Dr. couple. Earlier in the week, I talked about how we decorated her office and today we’re revealing his office. 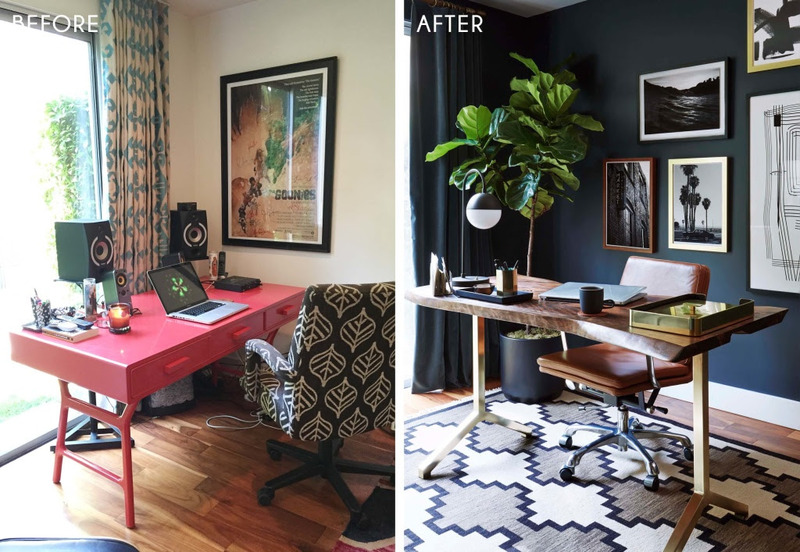 Much like the brief from his wife, the client really wanted the room to be cooler, look like it belongs in their mid-century home and feel layered. He really disliked the rug, drapery and office chair and was pretty much open to anything. 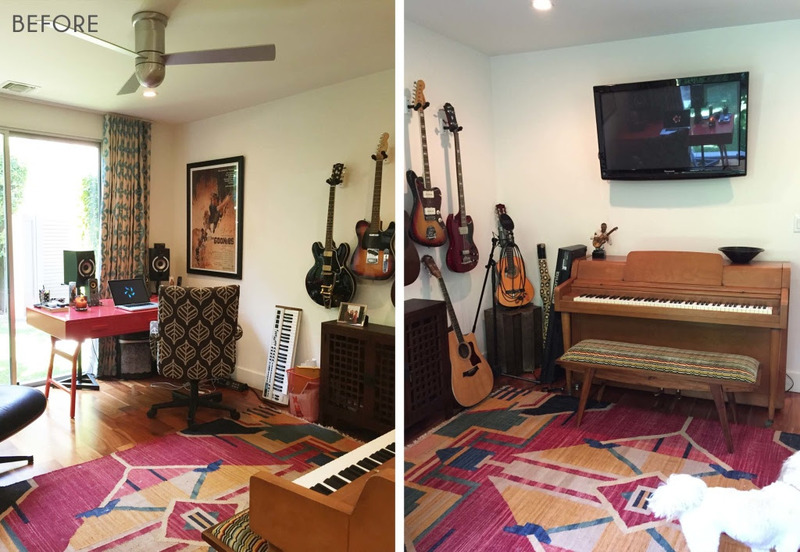 He wanted to keep the Eames lounger and the piano (he’s a musician) but didn’t want to have the guitars on the wall anymore. This was a great blank slate for us to work with. 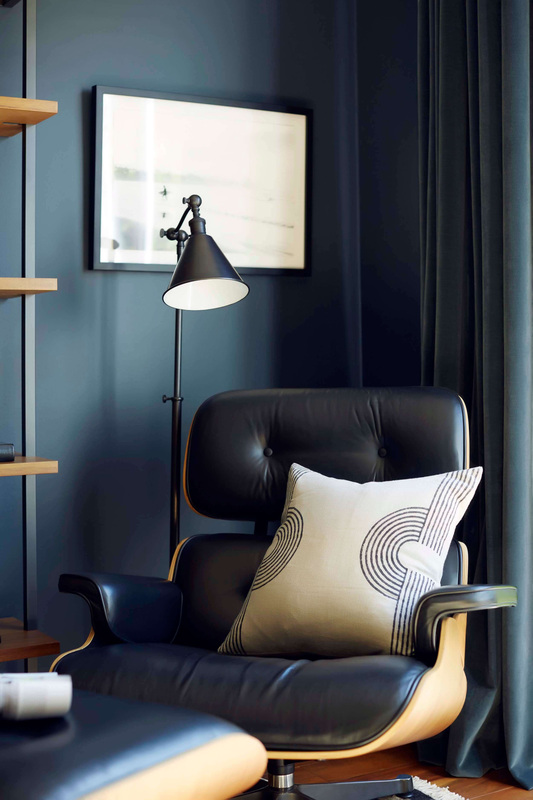 We really wanted to make this into a cool, moody den without going too ‘Man Cave’. So we started to pull together some moodboards to show him what we were thinking. He didn’t need much convincing on his space and really liked everything we suggested so next steps were to just get on with it. And here it is. 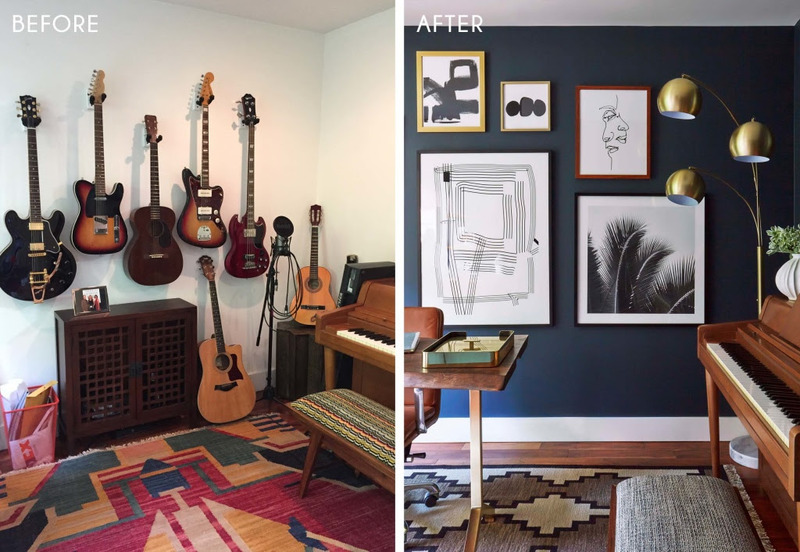 One of the first things we hunted down for this room is the rug. We’d seen it on an inspiration image and fell in love with it. 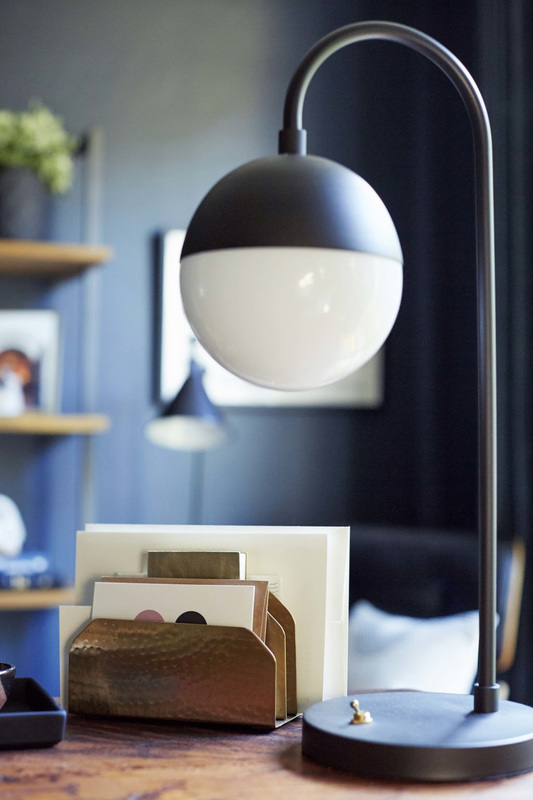 It feels masculine and graphic, playful yet sophisticated. I’m personally not drawn to brown but there is something special about this rug (to me at least). Much like the rest of the rooms in the house, one wall had the cream grasscloth wallpaper on it. We convinced him to get that removed and paint that whole room out in Blue Note from Benjamin Moore. 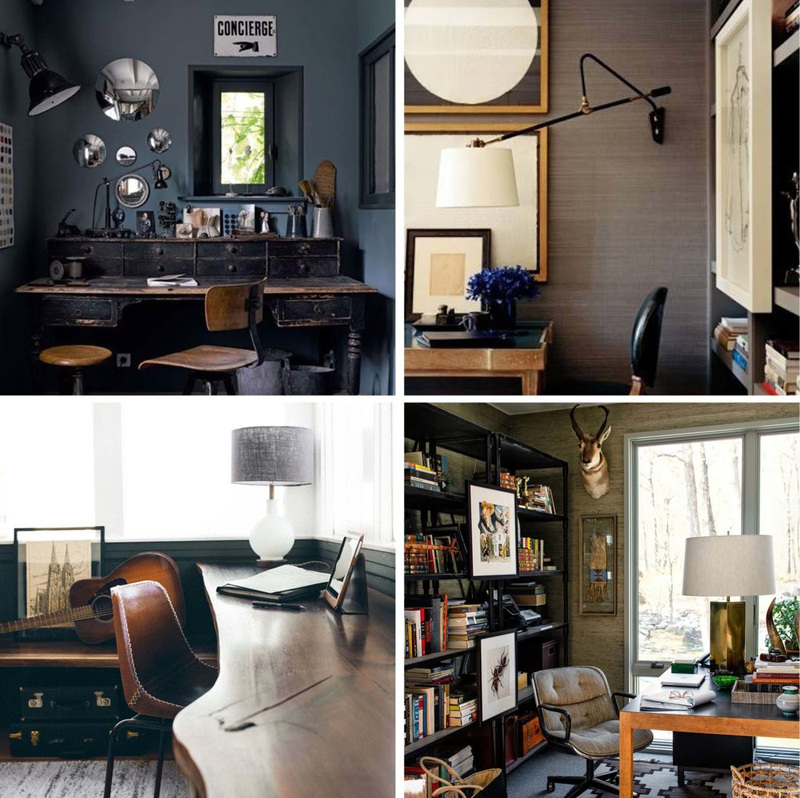 We love how dark and rich the colour feels in here. We went tone-on-tone with the drapery and introduced a velvet texture which feels super plushy in here. 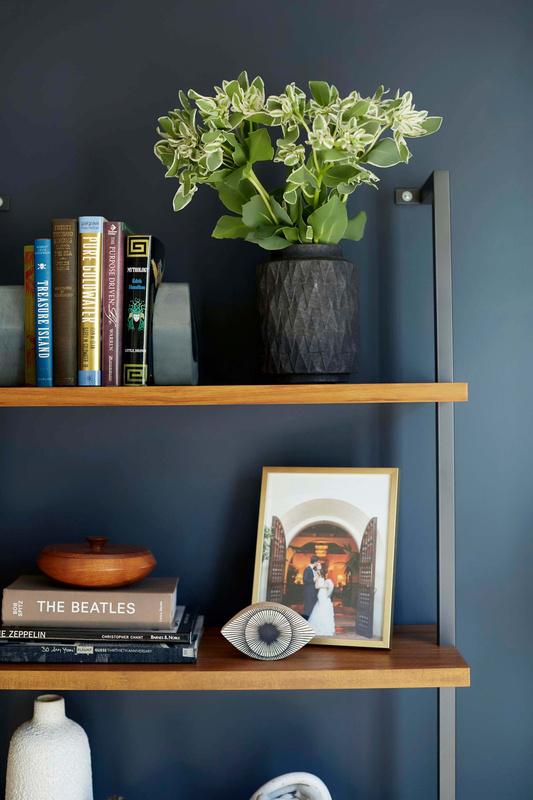 These guys are the vintage velvet in slate blue from Restoration Hardware. 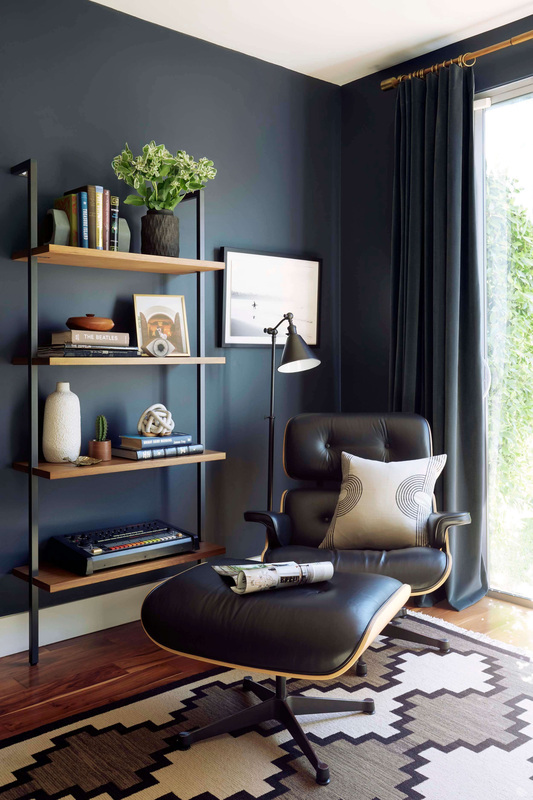 We made this corner into more of a reading nook using his Eames chair and ottoman. 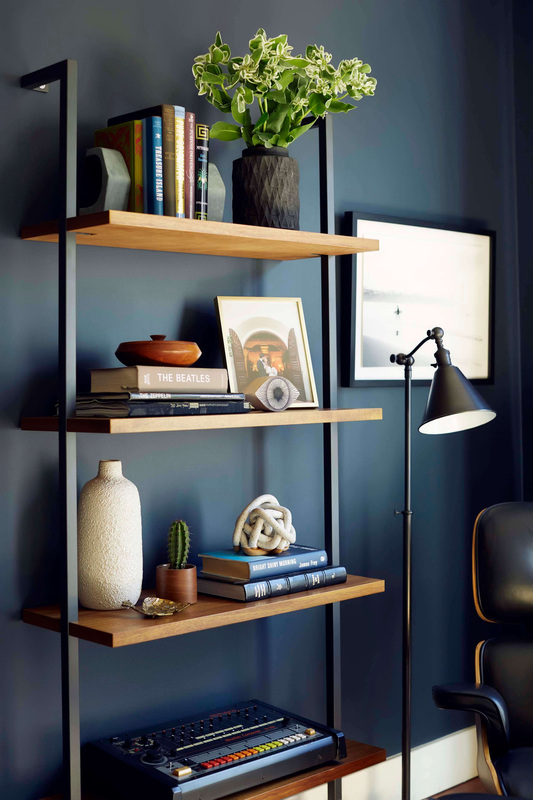 He already had the lamp, so we added the bookshelf; a mix of black metal and wood which sits great against the dark backdrop. We brought in a mix of different pottery for the shelves and combined that with his music equipment and books. We did another Block Shop Textiles pillow in here in a more neutral tone. 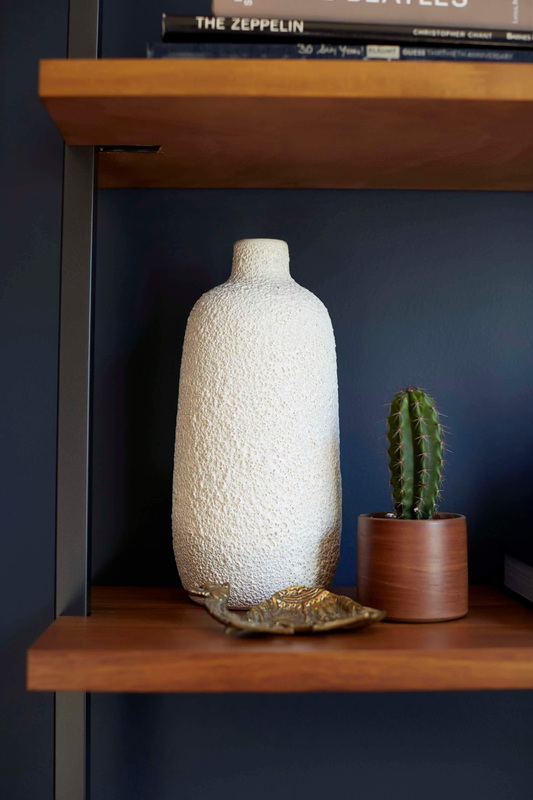 We always try to add pieces from local and/or handmade and the cute brown cacti planter is by Melanie’s boyfriend Blake Beaudette. 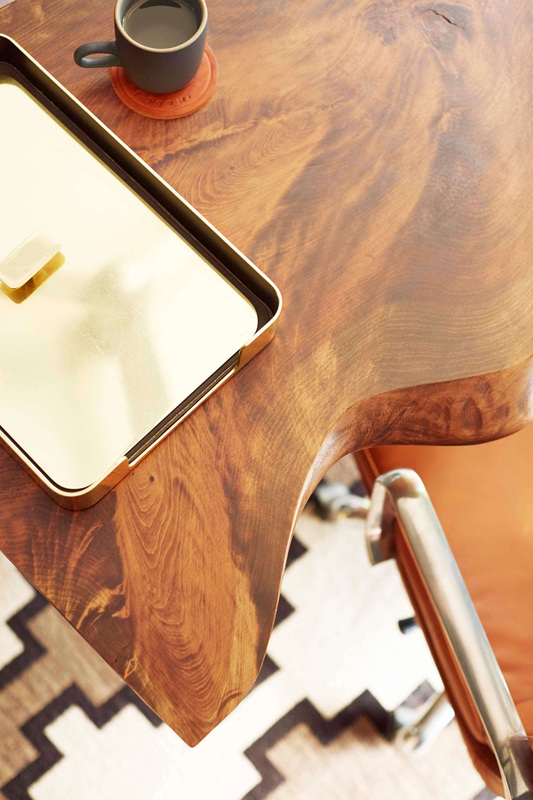 We worked with Matter Maker to custom make the live edge desk. The wood is walnut and has an organic cut-out in the middle for where he sits. We designed a simple leg base and had it finished in brass. 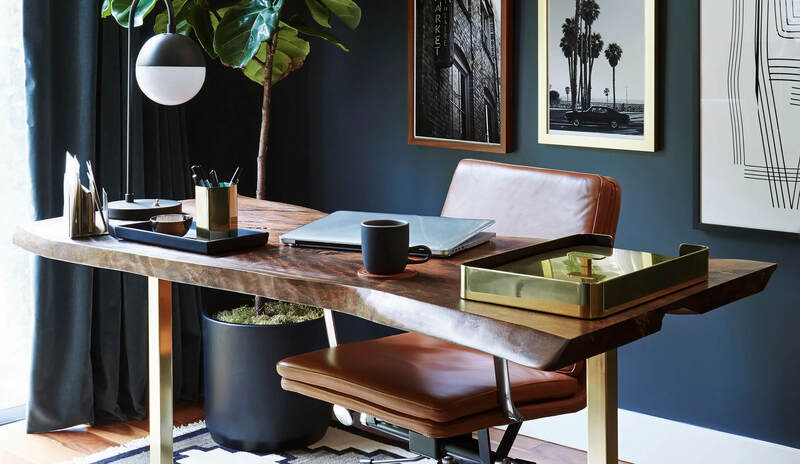 The desk chair is from Pottery Barn – it ain’t cheap, but in the tan leather it’s rather good looking and comfy and works great with the concept. 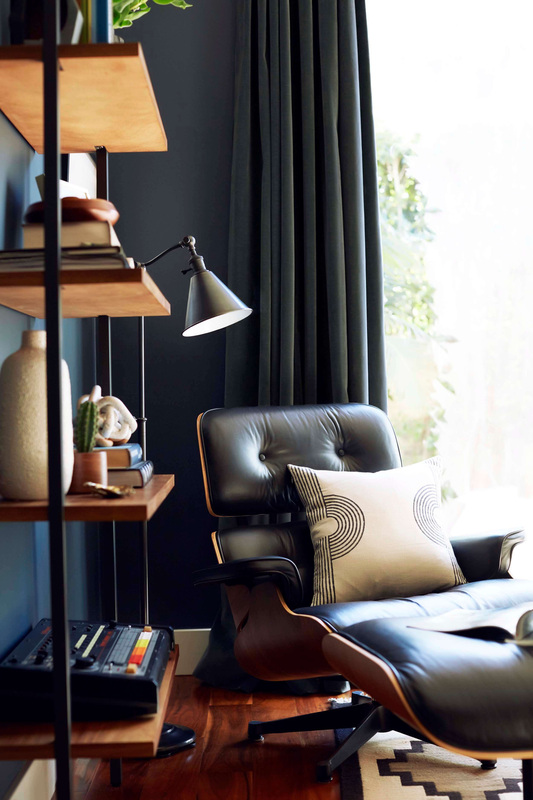 It’s really tricky to find decent looking chairs that aren’t those crazy ergonomic ones. 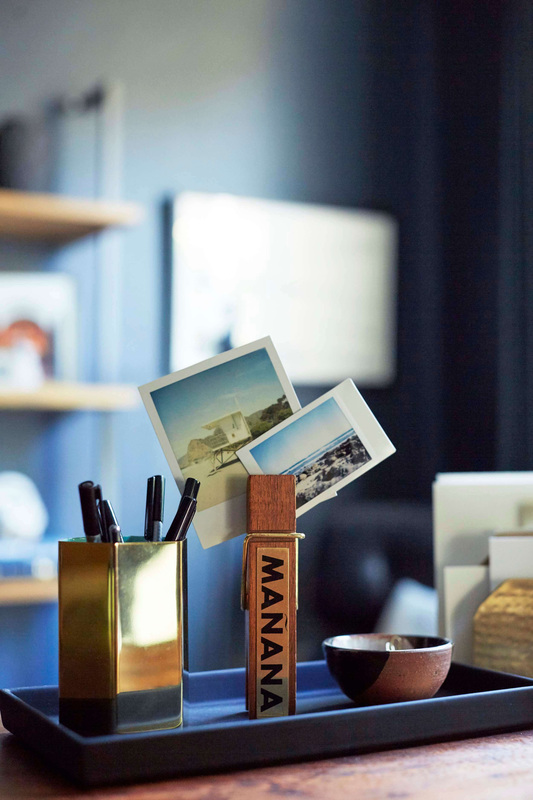 We dressed up the desk with some black, brass and wood accessories and the table lamp from Rejuvenation. 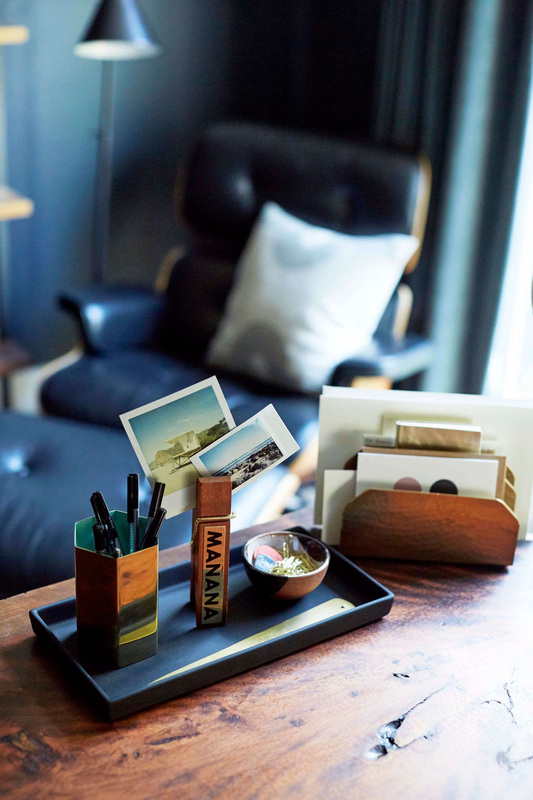 You can appreciate here how the desk has the natural curves from the cut wood. 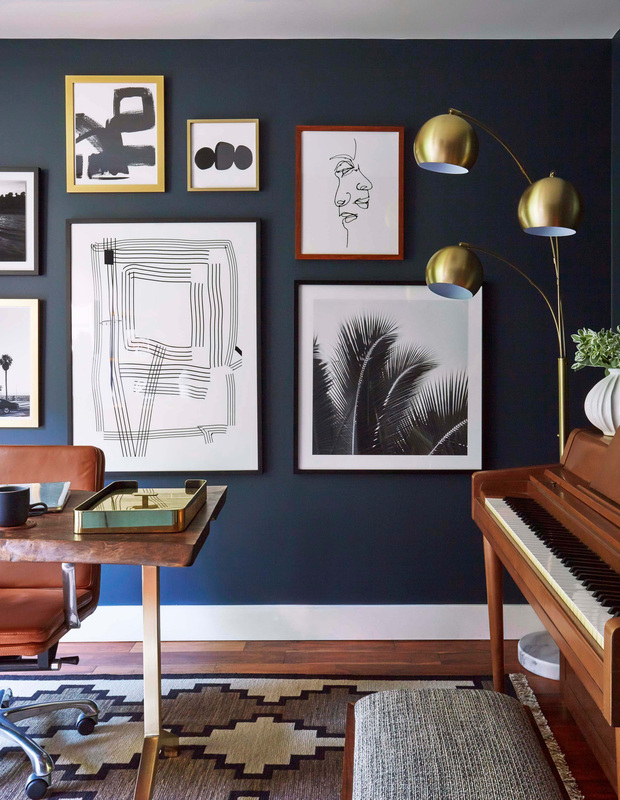 The back wall was a large expanse of space, so – together with Minted and Framebridge – we curated a gallery wall with a mix of photographs and prints of sketches and paintings. 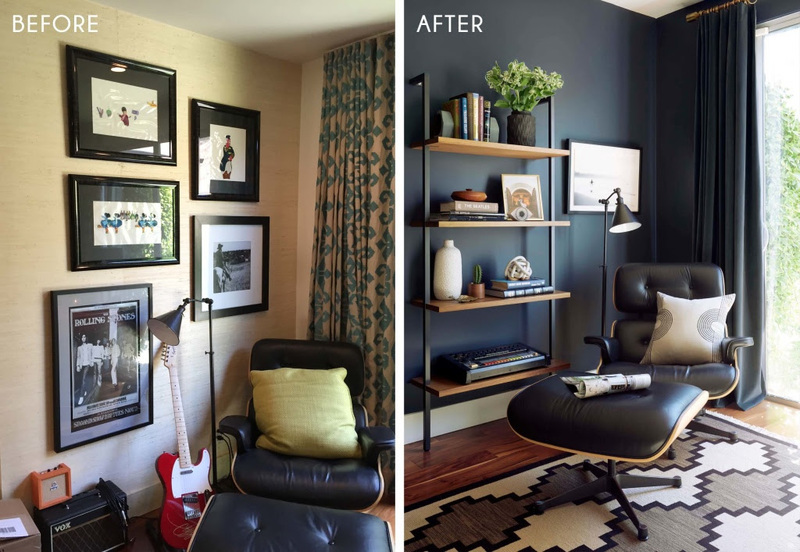 We kept all the prints monochromatic but then mixed up the finish and thickness of the frames so that it felt more eclectic. We reupholstered the piano stool in a mid-century woven fabric which has the same colour tones as the rug. 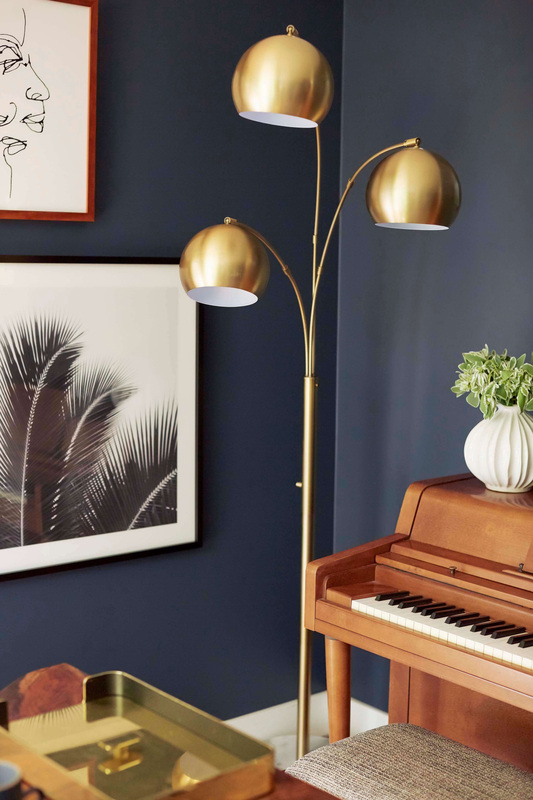 We added the brass standing lamp last minute, and it really pulls that corner together and gives it some three-dimensional height. So, there you have it. 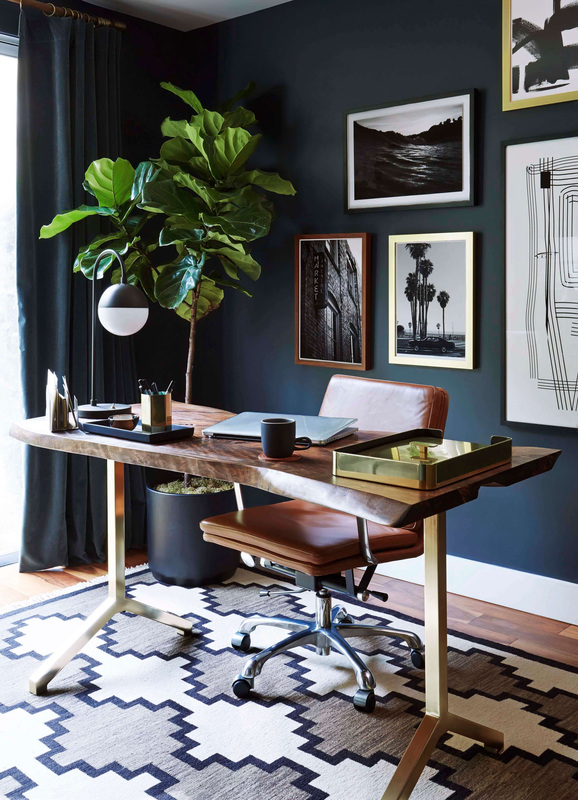 Do you think it adds a good amount of cool and moody to the room?